Trisolute News Dashboard wins at the UK Search Awards 2016. Today we are full of joy – what seemed like a dream has become reality. 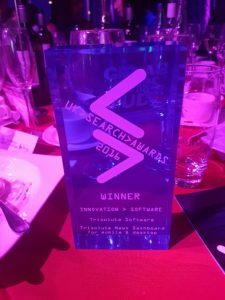 We won the UK Search Awards in the category Innovation Software. But this big hit was not only our success – it was a team effort of all our employees, partners, customers, the judges and all the people that have always believed in us and supported us. Achieving this award completes the triple of US Search Awards, UK Search Awards and German Search Awards in 2016 for us. It is part of a great year for us and we are elated that our hard work has paid off. We are ever grateful for your continuous support and we strive to develop further – together with you.